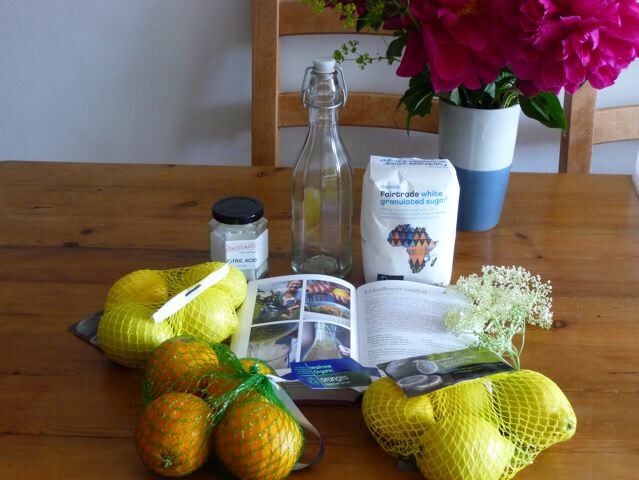 The recipe, method and important advice on sterilising bottles all come from Pam Corbin’s wonderful and indispensable book Preserves. There are always different ways to make something like this, but she hasn’t let us down yet. 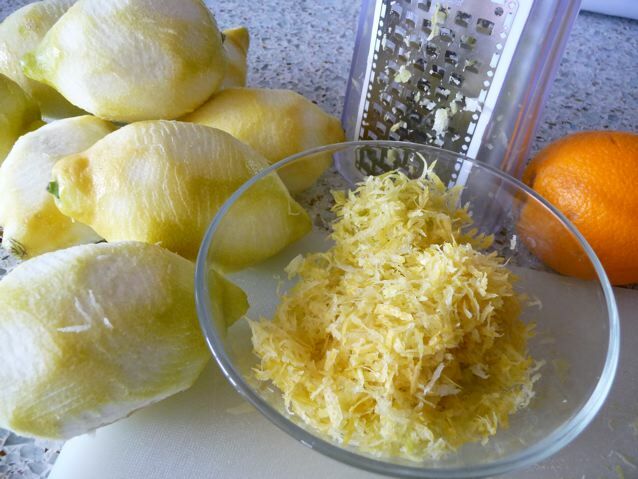 Unwaxed lemons and oranges are a good idea if you are planning to include zest in anything. If you can’t get them then give the ones you have a really good scrub to remove any coatings. I used organic fruit but if I couldn’t get organic I would still have a go at this. The elder flowers aren’t there all year round after all. I treated us to some fancy bottles with ceramic tops – though not enough in the end for the quantity of cordial we ended up with – and a jar of citric acid from the Jam Jar website last week, as well as a very important mini funnel. I think if anyone is thinking of producing this stuff on a big scale they would need to really hunt around for a cheaper source of container though and recycle as much as they can, which is what we did for most of the bottles we used. I have to tell you that Brian took over at a certain point in the process, as he loves filtering and bottling and sterilising. Says it reminds him of when he used to make beer! My first job was to sit and inspect the flowers for insects and caterpillars. I had a little help. We found a few caterpillars and some green bugs I had never seen before but they were surprisingly empty of visible wildlife. I was pleased about that. I then zested eight lemons and a couple of oranges. The bag of flowers, and the two lots of zest were flung into the beer tub where I admired their transient beauty and grabbed this shot. I squeezed the juice from the fruits separately and stored it in the fridge for the following day. 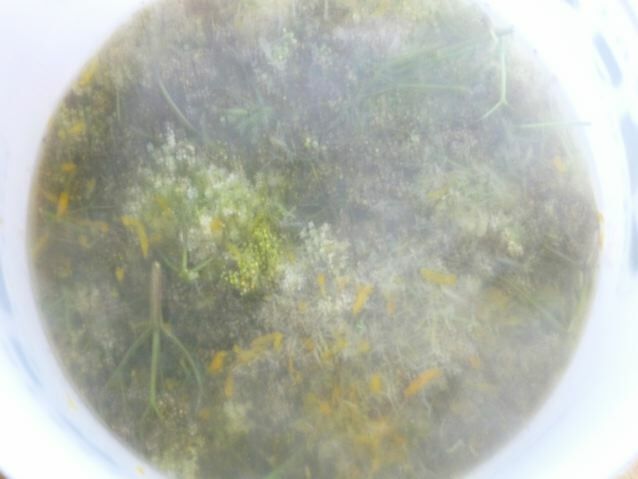 Then we created a witches brew by boiling numerous kettles of water until we had enough to comfortably cover the flowers and zest. 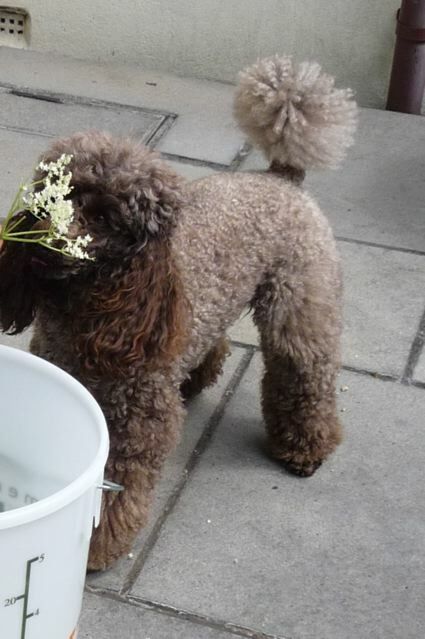 The flowers mostly turned brown and the whole thing smelt faintly of wee and hot green stuff. Quite scary, but one has to believe that Pam Corbin knows what she is doing and it says in the book that this is an old River Cottage recipe so we thought we can blame Hugh FW as well if it all goes wrong! We put the lid on the tub and left the whole lot to brew for twenty-four hours. 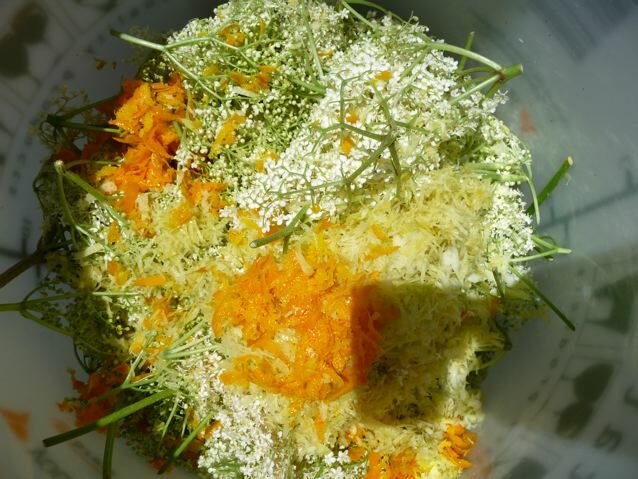 This entry was posted in Dog Walks, Plants and Trees, Preserves and Cordials, Recipes, Wild Food and tagged elderflower cordial, Pam Corbin, River Cottage on 14/06/2010 by Joanna. My mother used to make us elderberry fritters from the blossoms. As I remember it, she used a light sweet fritter batter, cooked them in hot oil, and then sprinkled them with a little powdered sugar. My Darling Bride got me a 15 lb. sausage stuffer that can also be used as a berry press, so I am looking forward to elderberry season this year. But your post has me thinking that I should try to use the blossoms as well. We are lucky here in that elderberries are common, and grow wild along roadsides. If you get off the main highway, they do not use sprays. A few years ago I collected several buckets for my father in law, who made them into wine. He was very proud of the ribbons he won that year at the fair, but always cautioned me that when you squeeze the berries you have to be careful or you can pick up a woody taste if you bruise the hard seeds. Keep up the great posts! You know we all look for that dog in the pictures. I would love to try your father-in-laws elderberry wine. I just walked round the woods with a dog walker showing her where the elders were. She was very excited and is going to have a go too. “but then a weed is only a plant in the ‘wrong place’ ” <– Love this!